IDTechEx research has recently published the new report 'Diesel Generator Set Future Developments and Alternative Technologies 2019-2029'. BOSTON, October 4, 2018	(Newswire.com) - IDTechEx research has recently published the new report ‘Diesel Generator Set Future Developments and Alternative Technologies 2019-2029’. The report provides a comprehensive and impartial assessment of the market for diesel and natural gas generator sets in the context of a changing global energy system. Based upon primary research conducted globally by IDTechEx analysts, the report tracks the latest research and commercial developments via rigorous stakeholder interviews as well as company and conference visits. The use of diesel generator sets has proliferated over the past decade as the primary choice for reliable mobile, stationary or temporary on-site power. The landscape is rapidly changing due to increasing environmental concerns and regulations, the rise of natural gas fuelled generator sets and falling renewable and battery storage costs. IDTechEx reviews the generator set industry’s technological developments in response to these changing conditions, as well as the zero-emission alternative technologies that threaten to displace generator set use in a variety of key industries. The analysis contained within the report is essential reading for any person or organisation that is involved in the generator set or fossil fuel supply chain or is working in the field of zero emission alternative technologies (solar, wind, ocean, fuel cell, energy storage). A complete evaluation of the diesel generator market is presented, looking at a breadth of system components and technology developments including a comprehensive patent analysis. All major generator set manufacturers and suppliers are reviewed, including current and future activity. Key industries and their use of generator sets are also examined in depth including mining, construction, oil & gas, telecoms, agriculture among others. Importantly, the merits and limitations of diesel vs gas fuelled generator sets are also analysed. Using IDTechEx’s 10+ years of experience researching and tracking the latest developments in renewable energy technologies and off-grid power, the research assesses the state of development of different zero emission technologies. Progress and in cost, performance, reliability and commercial activities are reviewed against the key remaining challenges compared to diesel or gas fuelled generator sets. 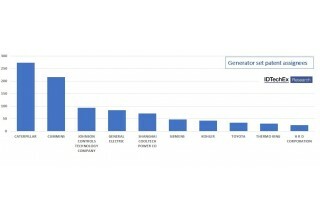 The technologies with the greatest potential to off-set generator set use are discussed as well as the end-use scenarios where generator set replacement is most cost-effective. A key finding of the research is the future importance of hybrid diesel generator/renewable energy/energy storage power systems and minigrids. We discuss how hybrid systems, rather than complete generator set elimination, presents the greatest potential for alternative technologies and how the most forward-thinking generator set manufacturers and suppliers are embracing this trend towards hybridization. We include ten-year market forecasts for diesel generator set, natural gas and alternative technology market values both globally and regionally. The forecasts are considered against key global megatrends and market drivers to provide valuable insight into future industry direction allowing the reader to understand the short-, medium- and long-term market sizes for each technology. IDTechEx forecasts are built up through a combination of detailed technical know-how, our long-standing engagement with the technology community and our in-depth understanding of end-use markets. Cost projections are based upon our in-house bottom-up cost models. 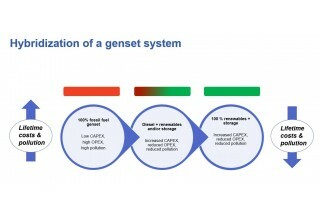 For more information please see www.IDTechEx.com/genset or email research@IDTechEx,com.